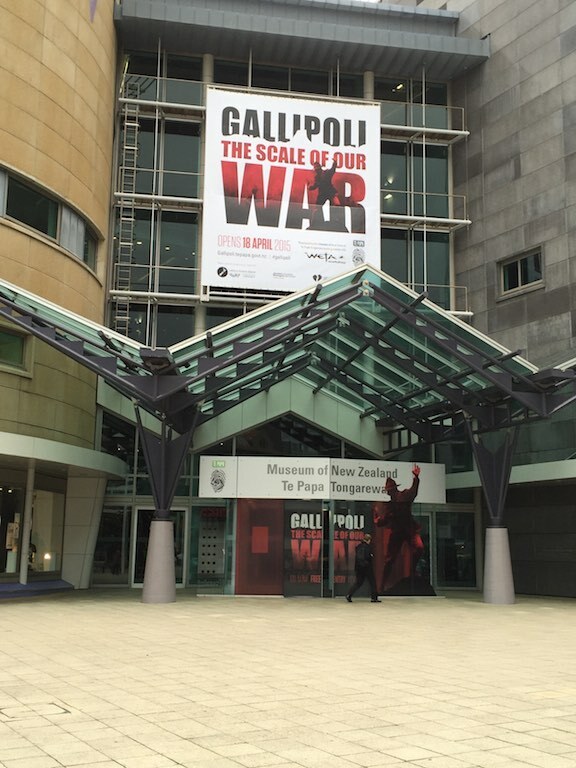 Visiting Wellington last week I took the opportunity to visit Te Papa – Museum of New Zealand to visit their Gallipoli exhibition. The exhibit was created by Weta Workshop, the same team who bought the movies from the The Lord of the Rings series to the big screen. 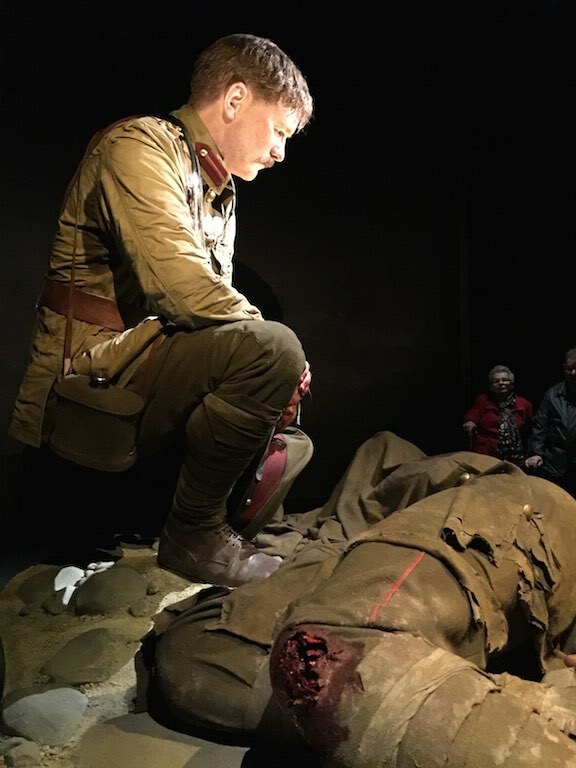 This time, they turned their hand to these incredible larger than life exhibits which bought some of the individual stories of World War 1 to Te Papa. For each of the huge figures, which were about 2.5 times larger than the average person, any second you expected them to move. They looked so real, you could see the sweat on their brow, the dripping wounds, the hair on their arms and the tears on their eyes. In each room you could hear the words spoken from a diary or letters home, simultaneously displayed on the wall, of their individual experiences at Gallipoli. 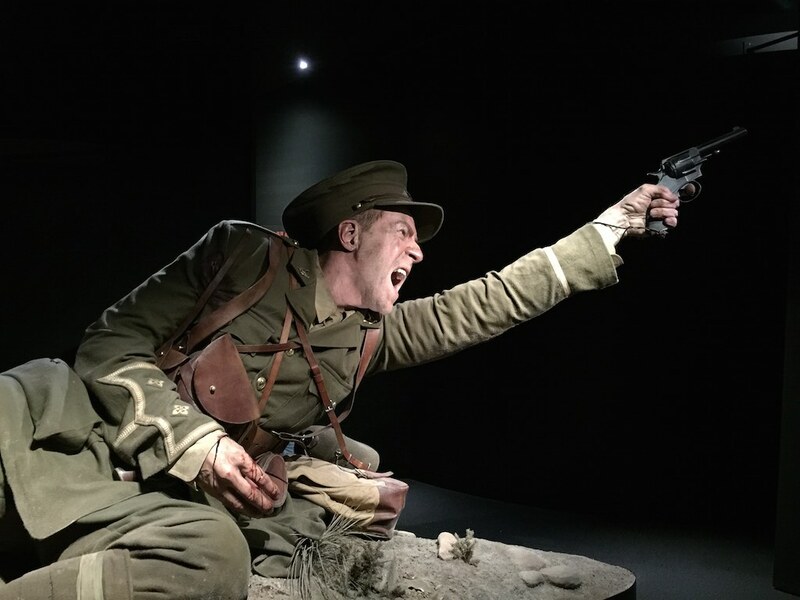 As you moved through the exhibit and timeline of the disastrous 8 months at Gallipoli, where 2,779 Kiwi’s died, you learnt more about some of these ordinary individuals, and their experiences of this hell on earth. The heat, the sickness, the stench of death and the bitter cold. 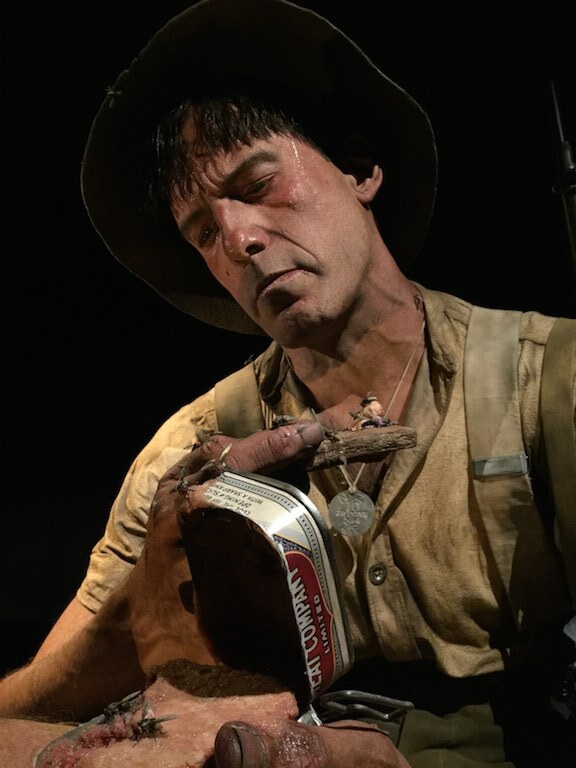 Interactive maps, dioramas and photographs combined with displays of weapon and uniforms gave you more of an understanding of the hardships that these troops suffered through. Lieutenant Spencer Westmacott, one of the first men to land on Gallipoli on 25th April 1915. At Baby 700 hill he reinforced the Australian line with his troops. His right arm was smashed by a bullet while holding off a Turkish attach. He was stretchered to the beach and evacuated. Lieutenant Colonel Percival Fenwick was one of New Zealand’s first doctors ashore at Gallipoli. In the 24 hours after arriving, he treated hundreds of men on the beach. Lieutenant Colonel Fenwick had previously served in the South Africa war, 15 years earlier. He set up a casualty station and worked at getting additional supplies. After two months he was shipped out of Gallipoli, ill and exhausted. 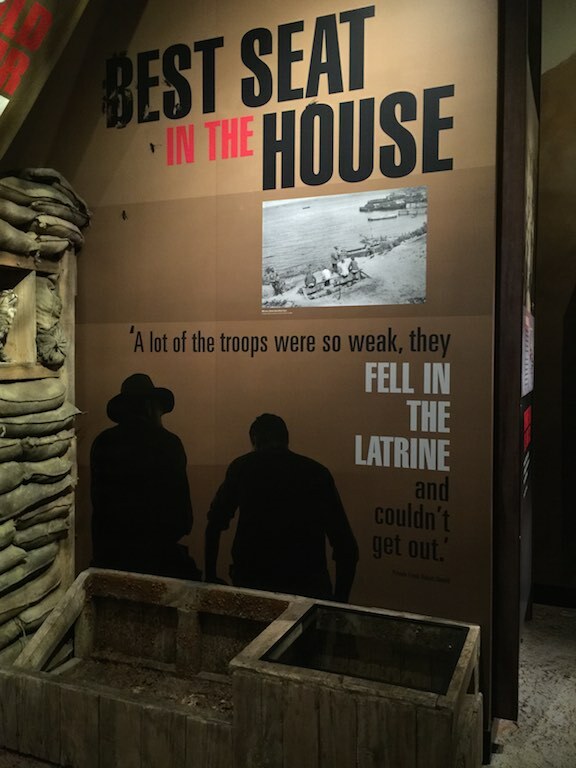 Wording as per the sign on the cabinet – Front-line first aid If you got shot, you prayed a mate would put on your First Field Dressing – just two small wads of gauze, one for the entry would, one for the exit. Then you hoped like hell a stretcher-bearer would find you in time. 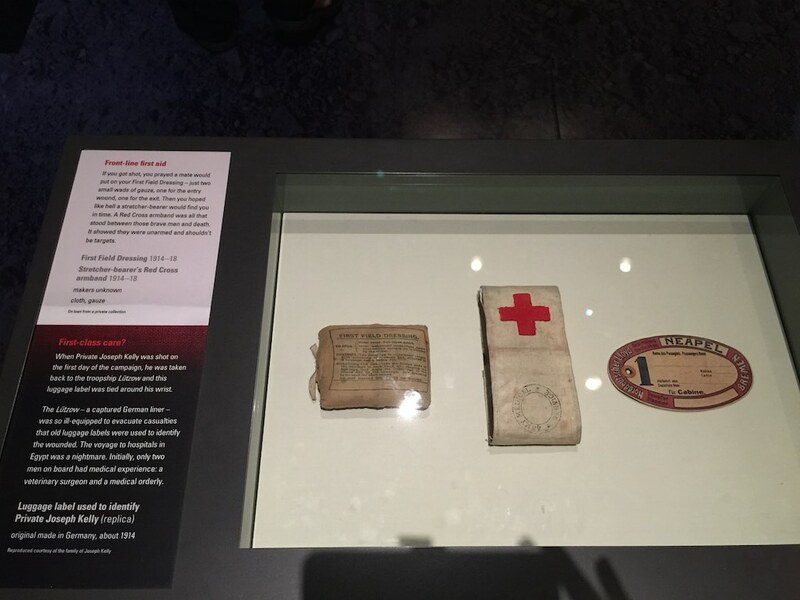 A Red Cross armband was all that stood between those brave men and death. It showed they were unarmed and shouldn’t be targets. First-class care? When Private Joseph Kelly was shot on the first day of the campaign, he was taken back to the troopship Lutzow and this baggage label was tied around his wrist. The Lutzow – a captured German liner – was so ill-equipped to evacuate casualties that old luggage labels were used to identify the wounded. The voyage to hospitals in Egypt was a nightmare. Initially, only two men on board had medical experience: a veterinary surgeon and a medical orderly. 100 years ago, times were different. There was reluctance initially to allow “natives” to fight by Britain’s leaders who saw World War 1 as a “white man’s war”. They didn’t wish to fight alongside Maori and other ethnic peoples. In New Zealand, Maori members of parliament campaigned for a Maori contingent, ready to ‘serve King and country’. Once approved, many Maori signed up, but some tribal leaders discouraged their men from enlisting, as they still felt they had been wronged by the British Crown a mere 50 years earlier. In July of 1915, the Maori contingent were permitted to serve. The 3 men shown in the following videos of the Maori contingent Machine-Gun section were Private Rikihana Carkeek aged 25, Corporal Friday Hawkins aged 23 and Australian born Private Colin Warden aged 25. On the night of August 7th, the 16-man team went up the ridge just below Chunuk Bair, joining the other machine-gun teams. The following day they came under intense fire but kept their guns going no matter what. More than half were killed or wounded that day. Private Jack (John) Dunn served as a machine gunner with Lieutenant Colonel Malone’s Wellington’s. He was from the Wairarapa and a keen athlete. Despite his fitness, he came down with pneumonia after the first month of fighting. Upon returning from hospital, he still wasn’t 100% healthy and fell asleep at his post and was sentenced to death for endangering his unit. The General took into account Private Dunn’s reputation and illness and returned him to the front line on August 4th where he was presumed killed in action within days. His remains were never found. He was 29 years old. 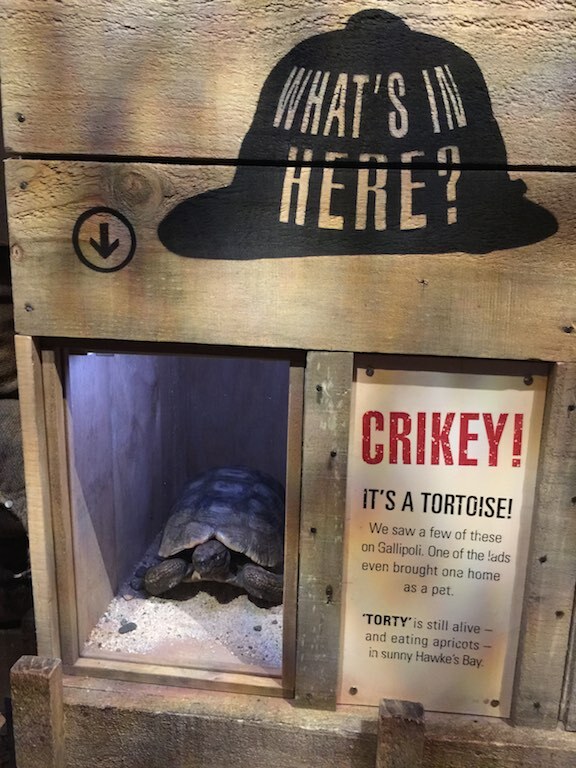 The only remaining Gallipoli survivor lives in Hawke’s Bay, a tortoise bought home as a pet. 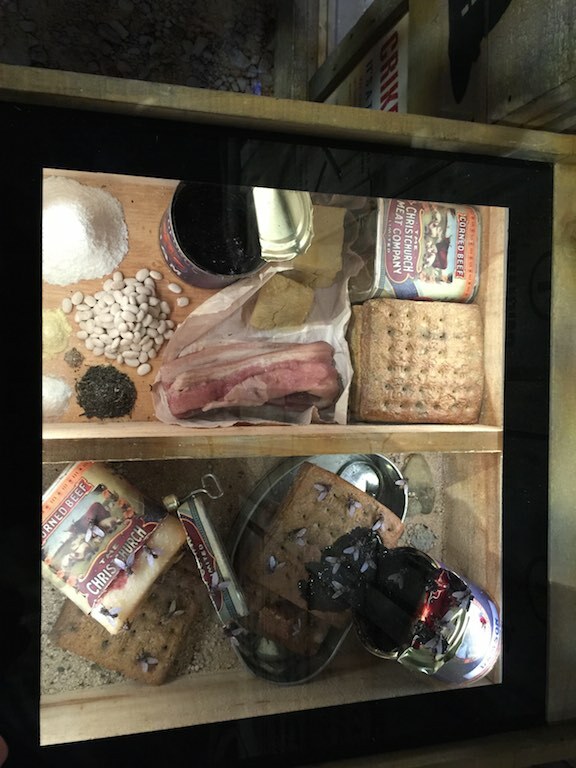 Examples of the food eaten by troops, hard biscuits which broke their teeth, jam and preserved, salted meat. Disease was rampant in Gallipoli, many of the troops suffered stomach issues. Some were so weak they fell into the toilet on the beach and couldn’t get out. Staff Nurse Lottie Le Gallais was a nurse onboard the hospital ship Maheno which left from New Zealand in July of 1915 heading for Gallipoli. She was hoping to meet up with her brother Leddie at Gallipoli. As the big push comes on the timeline through the exhibit, you enter the trenches. Its dark, its vibrating with the gun fire and explosions, two screens show troops in the tunnel as you walk through. 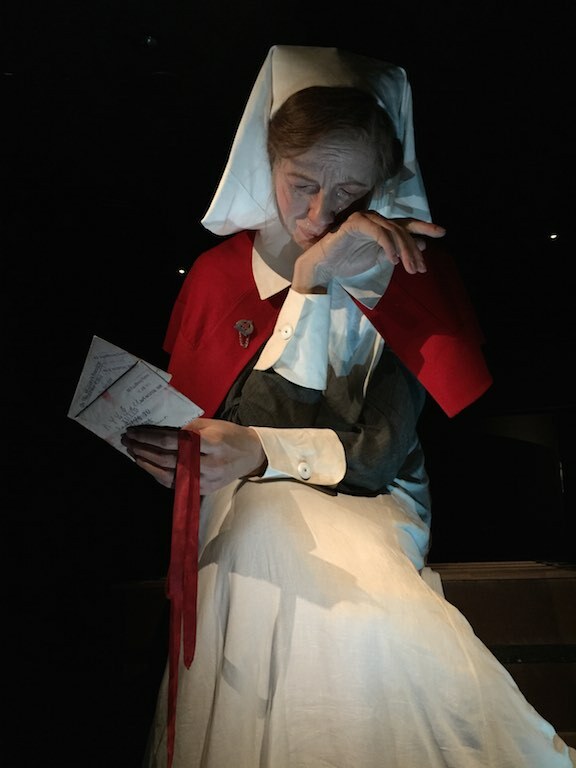 As you move your way through the exhibits, you learn more of the various people highlighted in this display and their fates. If they were “lucky” (I’m not sure that lucky seems quite the right word) enough to survive Gallipoli, many went on to die on the Western Front. By the October, the heat of summer had gone and supplies were held up due to storms. In November came the snow and those who had cut up their uniforms, that were far too hot in summer, now were literally freezing. Towards the end of November it was decided to withdraw, so over the next few weeks troops were secretly removed from Gallipoli, unbeknownst to the Turks. The last figure in the exhibit is this soldier. I didn’t get his name, by this point I was struggling to see through my tears. 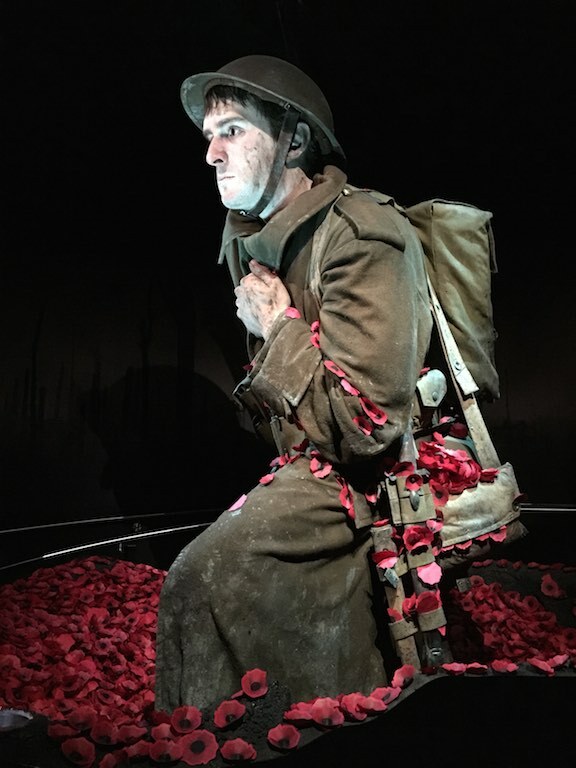 You could take a paper poppy and write a name or a thought on it and place it by this soldier. 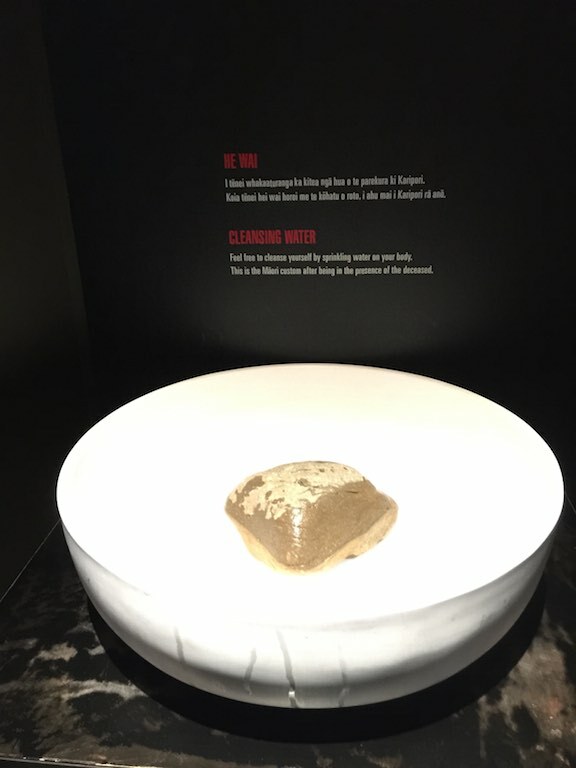 And the final step, a bowl of water, a Maori custom to cleanse yourself by sprinkling water on your body. This is customary after being in the presence of the deceased. So the exhibit runs for the next 4 years. 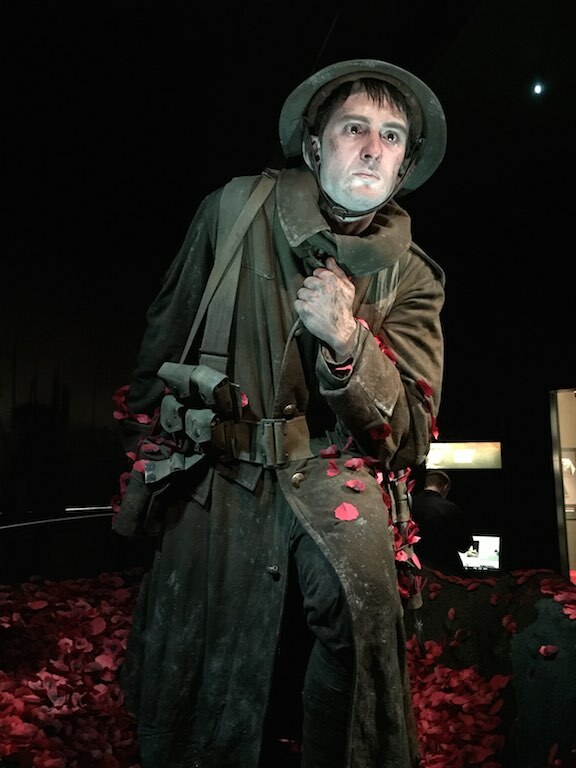 Its free entry to Te Papa and well worth a visit if you can make it to Wellington. Until reading your post this evening, I had not realized the horrific losses suffered by the New Zealand troops at Gallipoli. 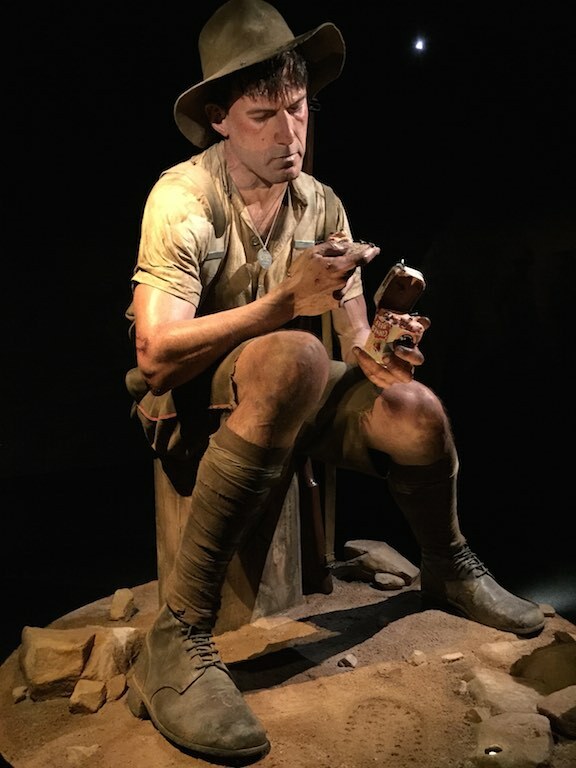 Too often, perhaps, their numbers are included with that of the Australian troops which reduces the percentage overall for ANZAC troops but hides the incredible losses suffered by the New Zealand troops. How anyone can visit such an exhibit and not find a bit of dust in their eye or a tightness in their chest is beyond my understanding. The lost of life was horrific! 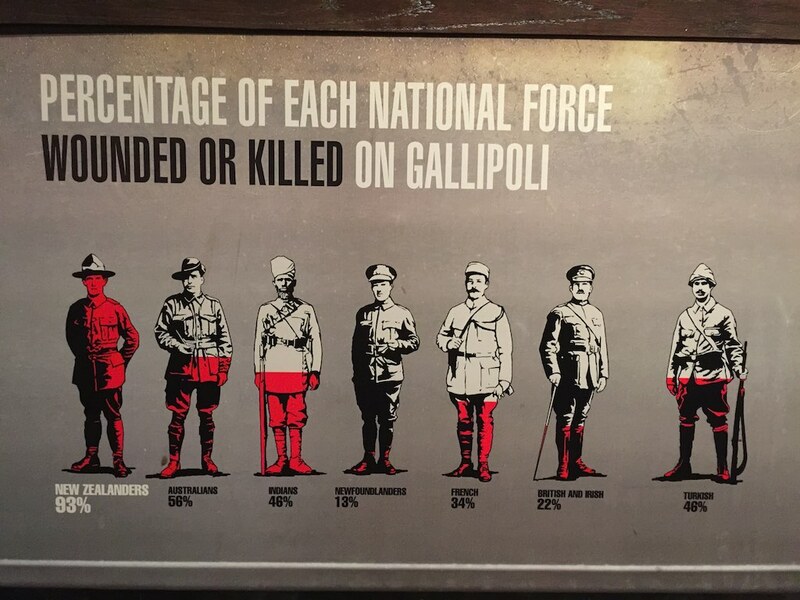 Nearly 10% of the entire NZ population served during WW1. WW2 didn’t have such a loss of life for NZ, but its hardly surprising that we no longer actively participate in war zones, except as peace keepers. It was a very powerful and emotive exhibition. Thank You for this fine sharing. Thanks for taking the time to comment. Lest we forget. Do you mind if I reblog this. I sometimes feel that we, in Australia, have taken ANZAC day for our own and forget all the others – especially you Kiwis. Please do! I would be delighted if you shared it with your readers. I know that some of you have seen this because you follow the blog as well as mine, but many of you wont. I feel that we in Australia, sometimes assume that Gallipoli was a war between Turkey and Australia and although I did mention the huge amount played by the British and the French I want to especially mention the Kiwis who are the NZ component of ANZAC. A very powerful and moving post. Thank you Sock Mistress and of course John for bringing it to my attention. I really must get to see this exhibition – the queues have defeated me so far. I have to disagree with their assessment of our percentage of casualties at Gallipoli. 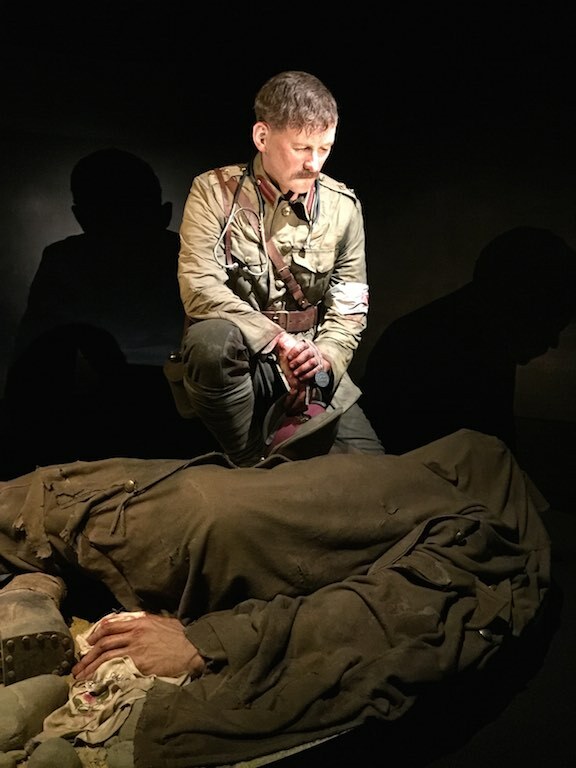 The number is wrong, because it relies on the usual figure given for the total numbers of Kiwis who fought there, which was never officially tallied and which understates them radically. In reality our casualty levels were similar to those of the Australians, about 47-53 percent. There isn’t space here to go into it but it’s something I need to check out further. In my own work on the subject I’ve only gone as far as noting that the number was incorrect – not trying to find out what it actually was. 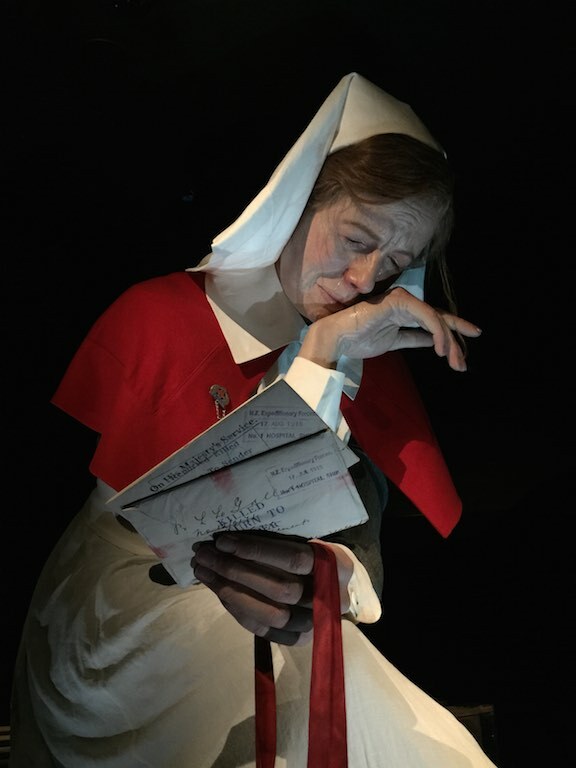 Of course this isn’t to understate the human disaster that followed the campaign – one wrung out in the diaries, letters, telegrams and notes I’ve read as part of my researches. It was a true human tragedy for New Zealand.